Week 3 of my CSA offers the usually buttery red leaf lettuce, beautiful kale and swiss chard, wonderful shallots and a special variety of red beets that resemble those that grew in Hawai’i. (sigh, I miss my Islands home) Oh… let’s not forget the micro-greens and the raspberries. 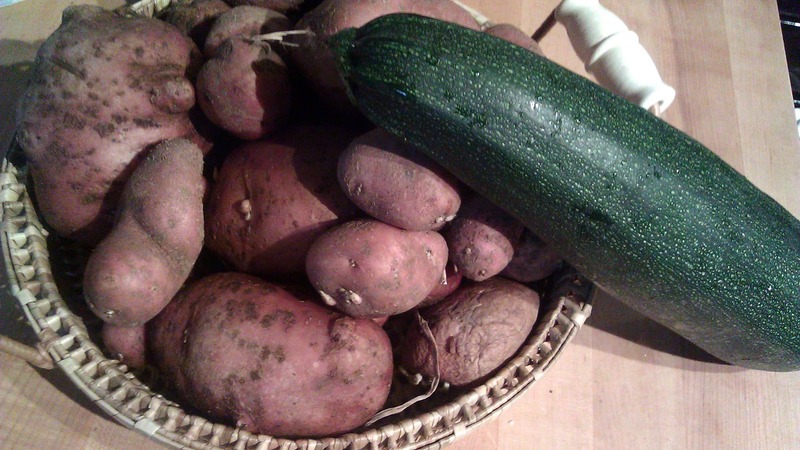 The challenge this week is the big crop of heirloom red skin potatoes and a giant zucchini! I had a few ideas as to what to do with these guys. I am going to pay tribute to my Jewish Mama Phyllis. I met Phyllis at my first job in New York. I was a youngster, clueless and tried to figure out the real business in the fashion world. Phyllis took me under her wings. Gave me advise and watched over me. She also taught me everything I knew about Jewish cooking and culture. Hmmm.. I used to believe that each kosher hot dog was individually blessed by a rabbi… (kind of like the arch-bishop or the Pope). I was watching PBS program about Russian Jew, they mentioned the immigrants brought bagels to America. I ran into Phyllis’s office first thing in the morning, and I said: “Did you know Bagel is Jewish and it came with the Russian?” I was so proud!! (Hey, just remember I came from the Islands, we ate sweet bread, bagels were not that popular back then). I can still hear she says: “What am I going to do with you?” She calls me her Chinese daughter and she is my Jewish Mama. We don’t see each other often these days, but she is in my heart every day. I love Jewish food, chopped liver and potato latke were my favorite. 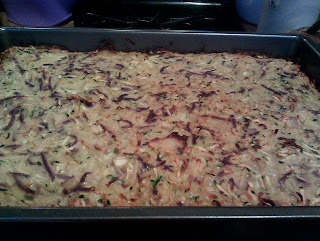 I thought of making latke with the potatoes, but I need to do something with the zucchini. I still have another 2 smaller week left from last week. 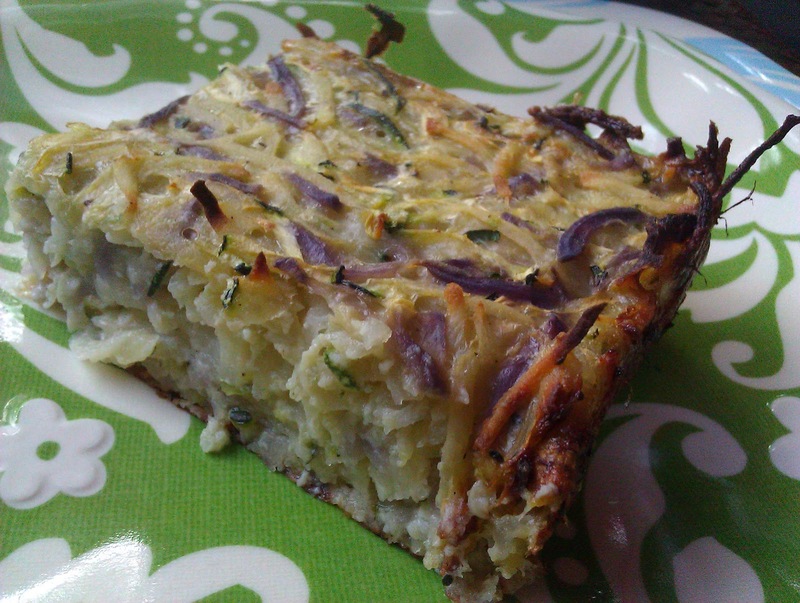 Potato Kugel came to my mind… so here is a lighter version. 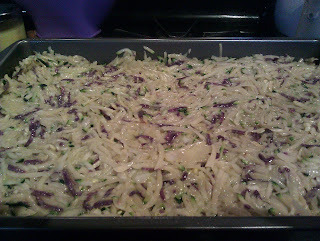 Apart from adding the zucchini, I am going to use the shallot instead of onion in this recipe. It will give the kugel a little more “kick”. 4 shallots (or 2 medium onion) finely chopped, about a cup. Preheat oven to 400°. Spray a 9x13” metal baking pan with non-stick cooking spray. 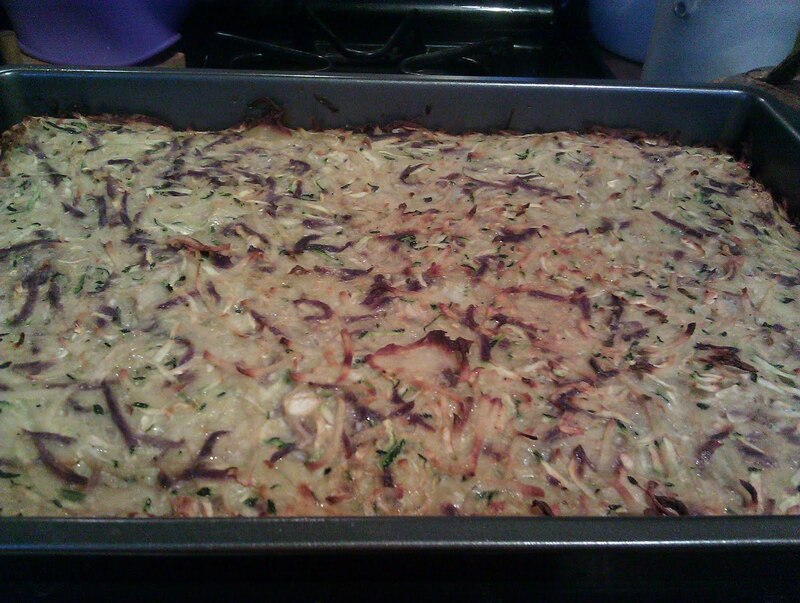 For this dish, I prefer a metal pan, I found that the kugel crisps up better. Grate the potatoes and zucchini in a food processor. Try to reserve as much “starch” as possible (It’s the white residue in the bottom of the bowl. 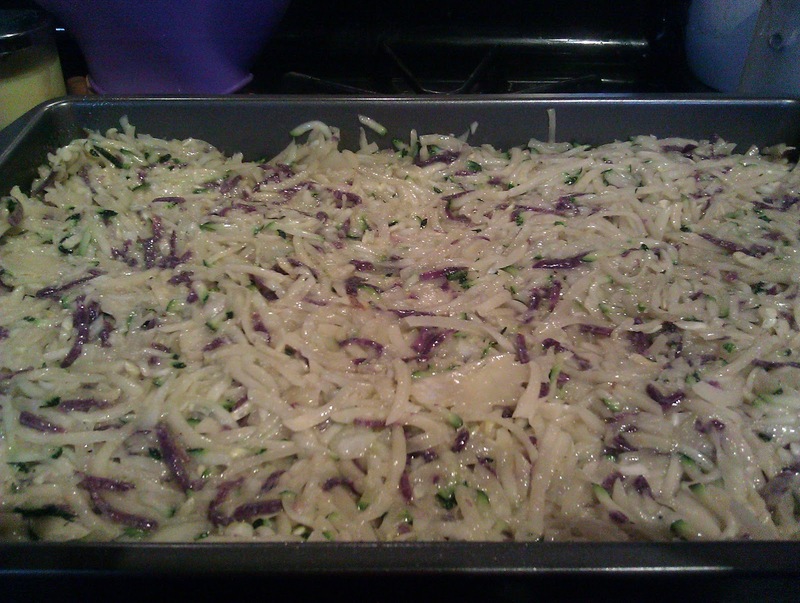 Add chopped shallots to the potato-zucchini mixture. Mix in flour, eggs, oil, season with salt and pepper. Bake, uncovered, for 1 1/4 hour or until golden brown on top and a knife inserted in the middle comes out clean. Let the casserole stand for 10 min, cut into squares and serve. 12 large serving as a side dish. I need to try this with eggbeater, gotta watc the cholesterol. Thanks!